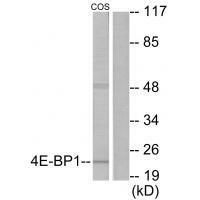 The antibody detects endogenous levels of total 4E-BP1 protein. Synthesized non-phosphopeptide derived from human 4E-BP1 around the phosphorylation site of threonine 70 (A-K-T-P-P). Regulates eIF4E activity by preventing its assembly into the eIF4F complex: hypophosphorylated form competes with EIF4G1/EIF4G3 and strongly binds to EIF4E, leading to repress translation. Mediates the regulation of protein translation by hormones, growth factors and other stimuli that signal through the MAP kinase and mTORC1 pathways.Anne-Claude Gingras, Genes & Dev., Jun 1999; 13: 1422. Guangming Liu, J. Biol. Chem., Mar 2002; 277: 8810 - 8816. Ya-Ping Jiang, J. Biol. Chem., Mar 2001; 276: 10943 - 10951. Anne-Claude Gingras, Genes & Dev., Feb 1998; 12: 502. Western blot analysis of extracts from COS7 cells, treated with EGF (200ng/ml, 30mins), using 4E-BP1 (Ab-69) antibody. 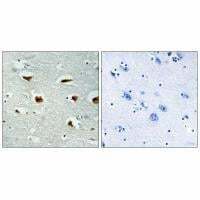 Immunohistochemical analysis of paraffin-embedded human colon carcinoma tissue using 4E-BP1 (Ab-69) antibody.